People spend an average of 80 percent of their lives inside buildings—restaurants, offices, hospitals, schools, airports, stores and homes. That means they also spend a significant amount of time in those building’s restrooms. And studies have shown that a commercial user’s restroom experience directly impacts their perception of a building—and, as a result, their interest in working, dining, shopping or visiting that building. In fact, according to research by GP PRO, more than 70 percent of polled patrons stated they would never return to a restaurant with dirty restrooms and 69 percent stated unclean restrooms leave a negative perception. Clearly, there’s a critical need to ensure a restroom experience creates value for users, owners and operators. Not surprisingly, technology likely holds the key to achieving this value. In particular, smart building technology. What is a smart restroom? At the heart of a smart building is the Internet of Things (IoT), which uses sensors to connect physical items to a common user interface on internet-enabled devices. 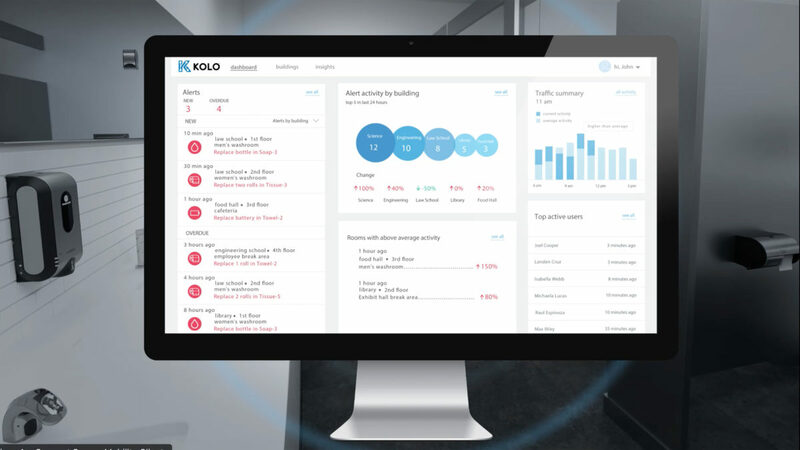 This connectivity between sensors and smart devices allows facility maintainers, property managers, and custodial staff to conveniently monitor and manage a wide array of building systems, features, and fixtures remotely, including lighting, heating and air conditioning, fire protection, security, maintenance and more. 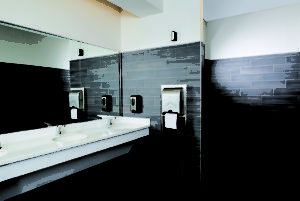 Within the commercial restroom, innovative sensing technology is readily available in a host of touchless fixtures, such as automatic toilets, faucets, and air care systems, and hands-free dryers and soap and paper towel dispensers. What’s missing is the connectivity. As sensing technology expands into additional restroom components, and as those sensors are connected and integrated into facility maintenance software, the commercial restroom will move beyond innovative to become intelligent. What does that digital disruption look like? Consider a restroom that is never out of tissue paper, soap or paper towels because the maintenance staff is notified via their smartphone when supplies are running low. Or toilets, urinals and sinks that are always clean because the custodial staff has usage data at their fingertips. Imagine a flush valve that can identify a potential leak so it can be quickly addressed and water supplies that can be turned off remotely to avoid a toilet overflowing or a faucet incessantly dripping. Because data can offer deep insights that enable more intelligent decision-making, it is a powerful tool that can provide a number of benefits to those who own, use and maintain buildings. Cost savings. The potential cost savings from smart restroom technology is significant. Labor savings will come from eliminating the need to check dispensers that still have sufficient supplies and through more efficient allocation of maintenance and cleaning staff resources. Cost savings also will come in the form of less frequent equipment failures and extended equipment life, as well as in waste reduction that comes from using an entire roll of tissue paper or paper towel before it is replaced. Elevated user experience. As noted above, a clean, well-maintained, fully functioning restroom is critical to a positive user experience. By arming maintenance and custodial staff with real-time data on plumbing problems, tissue and towel consumption, fixture breakdowns, washroom usage, and more, that positive experience will be easier than ever to provide. 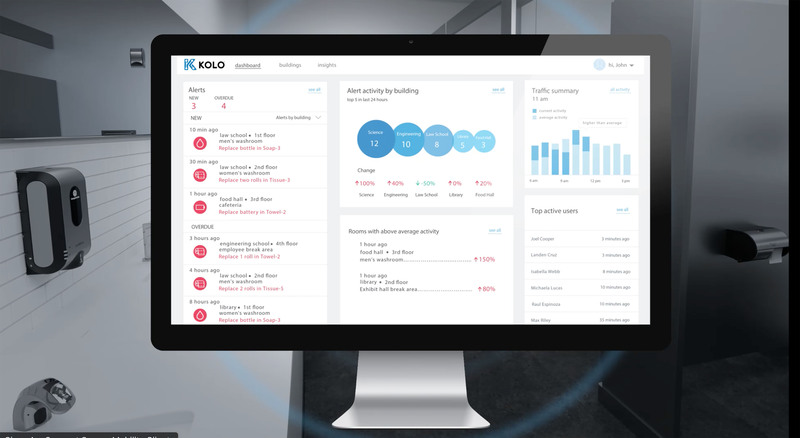 Improved employee accountability and engagement. Not only will smart technology identify problems, consumption, breakdowns, usage and the like, but it will also report back on when a paper towel roll was replaced, when a leak was repaired and when a cleaning was completed. This data keeps management apprised of employee response and servicing times and, as a result, keeps maintenance and custodial staff accountable to quickly and effectively performing their tasks. Mike Slawson is vice president and general manager of the IoT-enabled dispenser business at GP PRO, a division of Georgia-Pacific and a leading provider of advanced dispensing solutions for commercial facilities. To learn more about GP PRO, visit www.gppro.com.